My December journal page is entitled “The Birth of the Sun”, in honor of the winter solstice and the long celebrated “return of the sun”. Inspired by the beautiful color palette of the sunrise, my piece symbolizes the light of the holiday season. The days are now getting longer and my sun contains the seed/embryo of the warmer months to come and its continuing journey towards light. 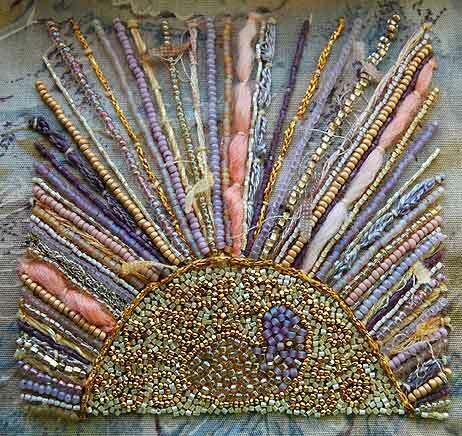 For me personally, I meditated on the light within my own heart as I set down each bead. Inspired by the beautiful fiber embroidery of fellow bead journaler, Acey at Nichobella, I have incorporated some fiber into my page for texture and color. In a photo of my page taken in sunlight, you can really see the texture. I have prepared a fabric square for my January page but I have not been inspired yet to set down any beads. As I am turning 50 this month, I think I will start the page on my birthday. I have a glimmer of an idea about the path/journey of my life as I reach the half century mark. As for November, my idea for a photo transfer will take shape once I begin my experiments as per my 2008 goals. I’d like to transfer a photo of my beloved greyhound, Buddy, who passed in 2001. Even though it has been almost 6 1/2 years since he has been with me, I still miss him everyday. First, January and then catch up with November. 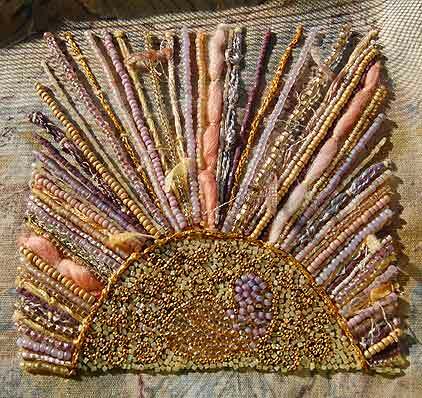 This entry was posted in Beaded Journal Project, Beads, Journaling and tagged bead embroidery, Beaded Journal Project. That is lovely. It is wonderful how the colors of the sunset inspired you. Your artwork reflects it beautifully. Wow, Karen! I loved what you’ve done so much that I spent several minutes gazing at the picture. Imagine my happy surprise when I got as far as reading and saw that I’d inspired you. Not coincidentally, I have given this blog a You Make My Day award. Thanks Frivolitea for your very kind comments! Thanks Acey for all of your inspiration and the wonderful award. Right back at ya! An involuntary “oooooo” escaped my lips when I saw your photo…awesome, karen! I’m with Bobbi — only mine was an involuntary sigh. Your page is most special and it will stay with me all day long. You certainly captured my idea of the sunrise, Karen. This is lovely and inspiring too. You were asking about an easy way to transfer a photo. Assuming the photo is on your computer, print it on special paper that is available and then iron it onto fabric. Just like embroidery design transfer. I have a package of Epson Iron-On Transfer Paper. The fabric needs to be cotton or a cotton blend. Good luck with it. Really nice. So often we think of the sun as just yellow when we stop looking at sunrises and sunsets. They really are filled with color as your page shows. Love the texture too. I still miss my Francois (my poodle who died in 2001) even though I have four other dogs. Every one of them is special. My daughter is feeling the pain now as she put her 15 year old dog to sleep this past weekend but the sun will rise again for her one day too. I love the way you captured the sunset colors in your piece, Karen ! The peach, lilac, and pale butter yellow tones are gorgeous. I also like the combination of beads and fibers. Amazing how nature can make almost any color combination ‘work’…. And thank you so much Kathy for your special comment. Thanks Arline, I’m glad you found my page inspiring. Thanks Marlaine, for your advice on transferring photos. That sounds easy enough to do. Great, I can get going with my November page now! Thanks Timaree, I know what you mean about sunrises and sunsets. Since I’ve started photographing them, I’ve noticed how beautifully colorful they really are. Thanks for sharing about Francoise. I’m sorry to hear about your daughter’s dog. I can understand the pain she’s feeling right now. They become so much a part of our lives with their wonderful doggy ways. Please pass along my healing wishes to her. Thanks Dora! Nature is so inspiring, isn’t she? And I’ve loved that color combination so much that I’m planning some jewelry as well. How very cool! I love the rays. It’s such an exuberant piece!